The success of Justin Trudeau, the Prime Minister of Canada, isn’t a not-known fact anymore. He is talked the most for his generosity, positivity and leadership. He is no longer termed as ‘privileged and naïve’. I have a great respect for this guy and have studied a lot of qualities from him. One of those qualities that inspires me is his persuasion towards a redefining leadership. There are four leadership values of him that drives me to be a better person. Diversity is the engine of invention. It generates creativity that enriches the world. – Justin Trudeau. He brought a fresh approach to the political landscape with his charismatic style and an approach to leadership that is respectful and collaborative. Many politicians talk about diversity while Trudeau made his first decision to embrace diversity and took an action on this. His cabinet is the best example of his views on diversity as a strength. He viewed it as a potential strategy to strengthen the potentials. His cabinet has half men, half women, gay person, a blind person, and few members who are non-canadian by birth. He states that “I like to be surrounded by brilliant people”. This statement of his proves that intelligence isn’t measured by race, gender or sexual orientation. I believe diversity within your team opens a door of opportunities for you. Not just with a business perspective but also in terms of self development, it truly helps a lot. Diversity helps in understanding different perspectives of singular thing and is beneficial for an individual growth. Definitely Trudeau is a man of good proposition of IQ, but that’s not the only quotient that made him a good leader. What matters to the people is his emotional intelligence or EQ. Justin consistently conferred a message of hope. Inspiring hope is a critical message for leaders and leadership, not simply because it is easy, but it evolves where there are changes in the environment and the difficulties experienced. Justin has an exceedingly high EQ, which is driving much of his success. With his acts of kindness, he keeps on proving that people need to know that their leader cares for them and only then, a true meaning of leadership is achieved. A leader isn’t someone who needs followers. A leader is a person who inculcates leadership in his audience. And this can only be possible if the person is able to understand the others. This demands a high level of EQ as it isn’t as easy as it seems. This develops a problem solving skills in an individual which leads to a better reign of productivity. Trudeau’s campaigning and governing is marked by an incredibly positive tone. 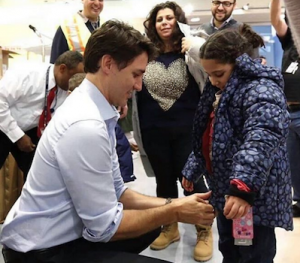 He not only welcomed refugees but also went to the airport to welcome Canada’s first Syrian refugees. Where others saw potential problems and concerns, Justin led through a lens of seeing what is possible. As a leader, he understood the need to foster and cultivate the ability to focus. Where the others talked about problems, Justin thrived towards solving them. He pursued those problems as opportunity for the betterment. A keen focus towards positivity ensures that you are well aware of the problems and they no longer seem to bother you. It guides you to be prepared of the upcoming hurdles long before they even arrive. Focusing towards positivity ensures you the constructive strategies to stay ahead and face the obstacles. Humbleness and politics, I know this sounds contradictory. But Justin has made this combination go well to work with. Justin stated in an interview with CNN that he would let the world adapt his approach in Canada. Justin listens to his people. He understands that listening is absolutely critical to leadership. It is an essential skill for him as a leader to create the trust with his team and citizens. He listens to his people in order to guide them in a right way with a clear vision. If we do a good job in trusting and listening to the people and being humble to them, we would not require to ask them to follow us. They will be obliged to do so. By being humble and by listening to your team, you ensure them with your trust and support. This is a key element towards team building. Being a leader doesn’t mean you have all the knowledge of the world. It means you share all the knowledge you have with the people and lead them towards positivity and growth. I thrive to become better day by day and all it takes is a little effort.